This is only the second tutorial I've ever written for Paint Shop Pro, and it came about while writing another tutorial to make Gradient Kaleidoscope Tiles, but I decided it would be easier to publish this portion as its own tutorial. You can follow the Kaleidoscope Tiles tutorial without doing this one first, since I zipped up the appropriate gradient and linked to it from that tutorial. If you ARE feeling adventurous, why not try this tutorial first and then follow the above link to the Gradient Kaleidoscope Tiles tutorial and try that one next. This tutorial was created and posted to this web site on May 13, 2001 and is © Miss B's Graphics from 2001 in perpetuity, all rights reserved, and is my own original design and not meant to copy or duplicate the efforts of any other PSP tut writer. Therefore, you may not download this tutorial and place it on any other web site, CD collection, or graphics group. If you wish to link to this tutorial from your graphics forum for use as a learning tool, I only ask that you first ask for permission via my Contact page (see Menu link above). There are no downloads necessary for this tutorial, so let's get started. OK, set your background style to none and your foreground style to gradient (see screenshot 1). Click on the foreground color fill style (which you should now have set to gradient), and PSP will automatically generate your gradient cache, and then display a small dialog box where you will select the style of fill - Linear - by clicking on the image in the top right corner of this dialog box, and then clicking on the Edit button below the default gradient window (see sreenshot 2). 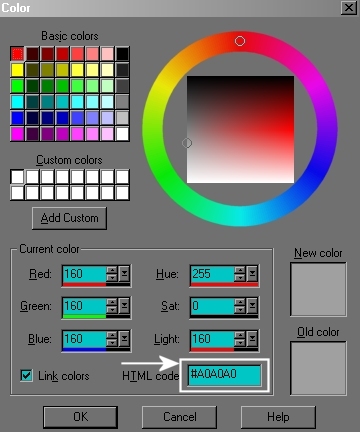 OK, now I'm going to show you how to create a new gradient. Click on the New button next to the window listing the different types of gradients (see screenshot 3) and a small popup window will open where you can name the new copy of the gradient. Let's rename it Raspberry Metallic. 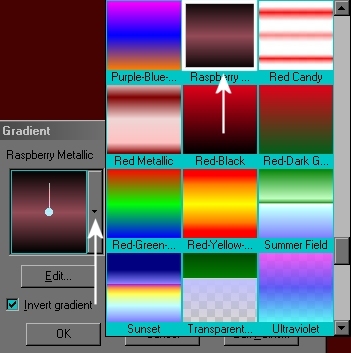 You will notice that your new Raspberry Gradient has only one color in the gradient view window (mine happens to be grey), but yours might be black or another color. At this point I want you to click anywhere just below the gradient window to add a third color indicator, and slide the indicator to line up with the center of the gradient window when the percentage number appears to be 50 (see screenshot 4). You should now have 3 color indicators. I would like you to make sure that the left indicator is at 0% and the right indicator is at 100% by clicking on each and sliding them into position. Now I would like you to click on the small diamond shaped objects above the gradient window and slide them until each indicates they are 50% between the 2 adjacent color indicators (see screenshot 5). OK, we're almost done. Now we're going to change each of those colors by clicking on the first color indicator, and then clicking in the small rectangle displaying that color to the left of that 1st indicator (see screenshot 5 above for location). When you click in this rectangle area, PSP's color palette will open and I want you to change the hex value of the current color to #000000 (black) (see screenshot 6 below). Do the exact same thing to the 3rd indicator all the way to the right and change it to black as well. Then click on the 2nd indicator in the middle, and using the same method, change the hex value of that color to #934B57 (raspberry red). Voilà! 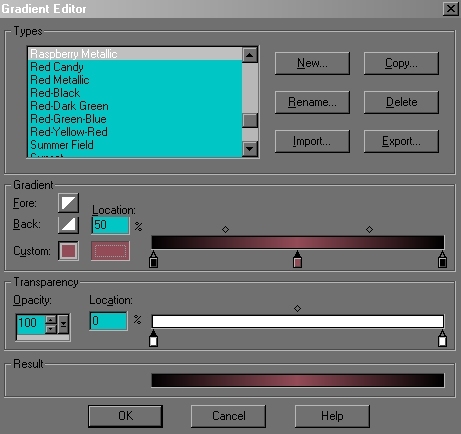 Your brand new gradient should now look something like the one in screenshot 7. Click OK to accept your new gradient, and then click OK again to complete the process. At this point, your new gradient is ready for you to use (see screenshot 8 below). I hope you enjoyed this tutorial, and that you'll try my Gradient Kaleidoscope Tiles tutorial by clicking on the following link. If you have any questions, please feel free to contact me via my Contact page (see link below).